Chilean musicians Inti-Illimani got the crowds standing and singing in their encore number, their signature protest song, El pueblo unido jamas sera vencido (A united people will never be vanquished). Upswing was the mood of an audience composed mostly of Chileans and Latin Americans, some of whom were dancing in the aisles to the music of this ensemble. Earlier in the programme, Vancouver City Councillor Kerry Jang awarded a plaque to the leader of the group, founding member Jorge Coulon, proclaiming April 24, 2012 as "Day of Latin American Music and Roots". An Ecuatorian family also gave scarfs to each of the members in appreciation of their visit to Vancouver. 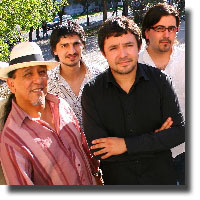 But Inti-illimani has developed through its 45 years of existence into music that is fusion and global. The group started as a protest vocal and instrumental ensemble in 1967 by a group of university students. They acquired widespread popularity in Chile for their song Venceremos (We shall win!) which became the anthem of the Popular Unity government of Salvador Allende. When Allende was assassinated and the Pinochet regime began in 1973, the group was touring in Europe and they were unable to return to their country because their music was censored by the ruling military junta. In the 15 years of exile, their music gained popularity in Europe, and they continued with their protest songs but developed music influenced from the European baroque and other traditional forms, fusing Latin American rhythms into them. The Vancouver audience was treated to around 20 songs in their repertoire of 400, including Latin beats such as the Peruvian Lando, the Cuban bolero, the Mexican Mariachi, the Colombian cumbia, and from Europe, the Tarantella, from Italy, and Malaguena and Danza di Cataluna from Spain. This was indeed a special event not only for Latin Americans but for Canadians who cherish human rights and social justice.